What happens when you watch a film so good that you literally feel unable to write about it? Generally I write one of my ‘Thoughts On Film‘ posts instead of a full review because my brain is too overloaded with awesomeness to formulate coherent thoughts. Here are some of my thoughts on this excellent film. Forget it, Anna of Film Grimoire, it’s Chinatown. I initially believed my favourite Faye Dunaway performance to be her hammy and crazy role as Joan Crawford in Mommie Dearest (1981) – NO WIRE HANGERS, EVER! – but I actually think her performance as Evelyn Mulwray in this has beaten out the hamminess of Crawford. I am also generally a Jack Nicholson fan because I find him to be one of the most charming actors of all time. Just look at how he hit on Jennifer Lawrence that one time. Nicholson’s charm knows no bounds in Chinatown, as wisecracking private eye Jake Gittes. A great performance. I also love that he spends the majority of the film with a big bandage over his nose. Polanski’s cameo as the nose-cutter was great. His accent was bad though. As with pretty much all of Polanski’s films, Chinatown has an amazing buildup of atmospheric tension that reaches a fairly devastating conclusion. This seems to be his directorial forte – films that take their time to develop tension and drama, only to shock and surprise at the very end. The film has many great noir-style shots, with excellent use of smoke and shadows as per the style of the original film noir genre. Polanski seems to love shots where smoke is filtering from one unseen person into another room. I’ve noticed that he had shots like that in both Chinatown and Rosemary’s Baby (1968). The music is also really wonderful – what feels like really 1970s-style sound effects and synth noises mixed with jazz music from the 30’s. A nice musical anachronism that doesn’t feel too out of place, but does feel slightly dated in a sentimental way. 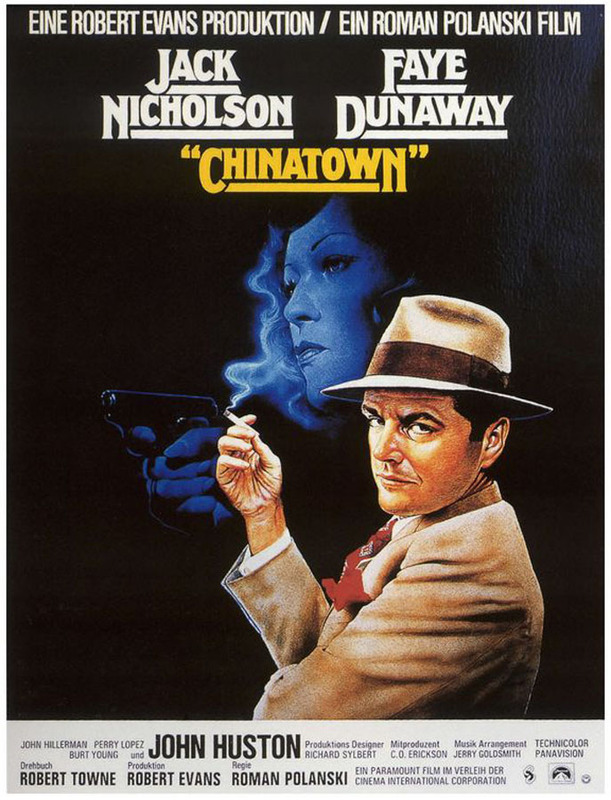 My only real criticism of Chinatown is that it does seem quite long for a noir film. At approximately 2 hours and 10 minutes, some moments feel slightly laggy, although I do acknowledge that Polanski uses his time well overall. I’m glad I finally got to see this. I still can’t believe I hadn’t seen it before, but I did really enjoy it and can now recommend it to others. You’ve got me hungry for this one now. It’s another film I’ve neglected for years, Good review. Thanks Gareth! Really liked this one, you should definitely give it a go! I don’t know why, but the first time I saw this I was pretty bored by it. It could be because I am also not a very big fan of Jack Nicholson. Maybe I’ll give it another go at some point now that it’s been twenty years or so since that first view. Glad you liked it and great write-up. Thanks heaps! I wonder if you really have to be in the mood to watch it. Maybe I’m lucky I was really in the mood to watch a neo-noir-ish film that day! I love this film, Polanski’s best! The ending is superb, so memorable and stays in your mind for quite a while. Such a devastating ending! It almost reminded me of Godard’s Vivre Sa Vie. So abrupt but leaves you thinking about it for long afterwards. Thank you Reut! 🙂 I often struggle to verbalise how I feel after watching films that are universally known to be amazing. Sometimes a list is the best I can manage! saw this once years ago. gotta rewatch it. great review Anna! I have to say that I didn’t enjoy it as much as you but it certainly was an event, rather than just film. That’s actually a great description! The whole thing does feel like a big event. Pretty epic. Chinatown is an excellent flick. You’re right, Nicholson is endlessly charming and Dunaway is fantastic. Like you, I also feel it runs a bit long. Still great, though. Wonderful post. Thanks Wendell! 🙂 I almost forgot about Dunaway’s performance in Mommie Dearest when watching this. Almost! This is simply one of the greatest movies ever made. That screenplay, untouchable; Nicholson, unmatched, Polanski, in a class of his own. And that ending. WOW! Glad you finally caught up with it. Thanks Reuben! 😀 I definitely agree with your sentiments. The screenplay is truly untouchable. So witty and clever. I love this movie!! Number 2!! I just watched it, that was awesome. He probably would have tried to date her back in the day. Totally! I think that video is so funny and awkward, what an amazing moment! Just received Chinatown in the post yesterday! I too haven’t seen this iconic film and need to get around to it pretty soon!